The Inspiration depicts a timeless classic (figure), who upon the foundation of other great thinkers and teachers has arrived at that moment when the solution is clear and the future is at hand. 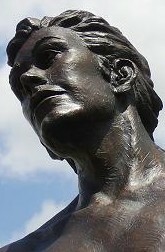 The sculpture expresses a moment of sudden elightenment. 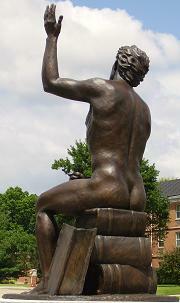 It was installed atop a plinth in front of the Hettenhausen Center for the Arts, on Alton Street in Lebanon, Illinois.